I have quite a few scone recipes on the site. So I guess it's obvious I love scones. I divide them into two categories. Those made with milk (or cream) and those made with buttermilk. The main difference is that scones made with buttermilk have a more soft and bread like texture. And that is what I used in this recipe. What's a little different is that I top each scone with a nice dollop of preserves (or jam) before baking. That way I don't have to bother cutting them in half and spreading on the jam afterwards. I like them best warm from the oven when the outside crust of the Scone is deliciously crisp, yet the inside is wonderfully soft and flaky. You can even smear a little Devon cream or whipped cream on the top of the jam before serving. A perfect way to start the day. Buttermilk has a thick and creamy texture with a rich and tangy buttery taste that is commercially made by adding a bacteria to whole, skim, or low fat milk. In a pinch you can make a great substitute by simply adding 1 tablespoon of white distilled vinegar, cider vinegar, or lemon juice to 1 cup (240 ml) of milk and then letting it stand about 10 minutes at room temperature. Another option is to use buttermilk powder, which is now available in some grocery stores and specialty food stores. Once the scone dough is made, it needs to be cut into rounds. (Although you can cut them into wedge shapes.) What's really different about these scones is that each scone is topped with some jam before baking. 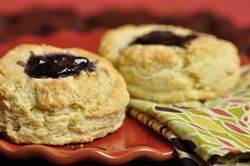 You do this by pressing your thumb into the top of each scone to make a deep indentation and then you fill it with a dollop of jam or preserves. You can use any flavor of jam or preserve. Jams and Preserves are essentially the same thing as both are a cooked combination of fruit and sugar (and sometimes pectin). The difference is that preserves still contain chunks of fruit, whereas jam is more like a thick fruit sauce. Scones: Preheat your oven to 375 degrees F (190 degrees C) and place the oven rack in the middle of the oven. Line a baking sheet with parchment paper. In a large bowl, whisk together the flour, sugar, baking powder, baking soda, and salt. Cut the cold butter into the flour mixture with a pastry blender, your fingertips, or two knives. You want the mixture to look like coarse crumbs. Add the buttermilk and stir just until the dough comes together (add more buttermilk if necessary). Transfer the dough to a lightly floured surface and gently knead the dough a few times. Then form into a 7 inch (18 cm) round. Using a 2 1/2 inch (6.5 cm) round biscuit cutter, cut the dough into circles. Place the scones on your baking sheet. Then, using your thumb, make an indentation into the middle of each scone, pressing down almost to the bottom of the scone. Try not to squash the outside edges of the scone. Fill each indentation with a scant tablespoon of jam. Bake for about 20 minutes or until golden brown and a toothpick inserted into the middle of a scone comes out clean. Remove from oven and transfer to a wire rack to cool.